Hello, GL girls! Enjoy reading this light-hearted short story written by author, Timothy Tocher! Tell us what you think in the comments below. “Will the Flying Ladies survive? Tune in tomorrow at 8:00 to find out. But right now, why not head for the kitchen and ask Mom for a healthy, hearty bowl of Olsen’s Oatmeal? It’s Linda and Kay’s favorite brand. Millie switched off the big, wooden radio. How she’d love to fly like Linda and Kay. She wasn’t at all worried about them. Linda would set that plane down as gently as a snowflake. Millie was the one with a problem. After saving for six months, she had only 13 Olsen’s Oatmeal boxtops and no hope of reaching 20. She could never eat 7 boxes in a week. Even with sugar or honey added, it tasted like library paste. Jerry gave a half wave, half salute that he had seen Lindbergh use in a newsreel and strode off, head held high. The next morning, Millie was in the kitchen, bravely trying to choke down a bowl of Olsen’s Oatmeal. Jerry sat at the opposite end of the table. Millie slid the cereal box toward him in invitation. “Why do you buy this horrible stuff, Millie?” he asked, sliding the box back to Millie’s end of the table. “Not for the taste,” Millie answered. She attempted to stir the oatmeal left in her bowl, but stopped when the spoon bent. “What kind of a show?” Millie asked. “Excuse me,” interrupted Millie. 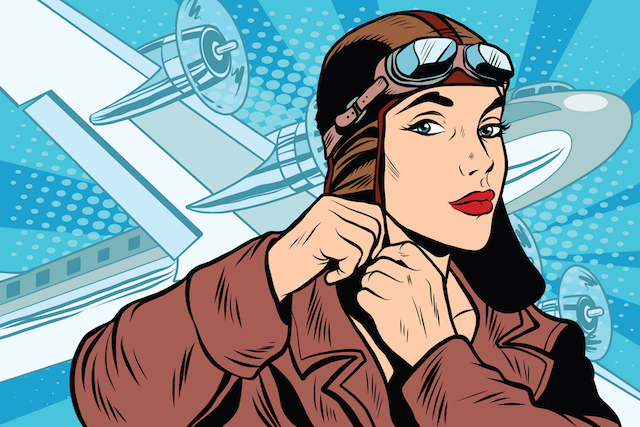 “Don’t you mean a courageous aviatrix and her dumb, but faithful, assistant who …? “We can work out the details,” Jerry said. Writing the play was easy. They had both listened to so many radio dramas that their heads were filled with ideas. Jerry’s uncle’s barn would be their theater. They plastered posters on every tree in the neighborhood. Millie drafted her twin cousins to work backstage. The performance was set for 7:00 on Friday night. Admission was 5 cents or one boxtop from Olsen’s Oatmeal. A curtain stretched across an old, hay wagon which would serve as their stage. A second curtain hid the twins from the audience. Sacks of chicken feed provided seating. Jerry pulled on his uncle’s leather football helmet - the closest thing to a pilot’s headgear that he owned. He ducked through the curtain. When the audience quieted down, Millie heard his voice. Jerry slid open the curtain. He joined Millie behind a cardboard cutout of an airplane, the name World Traveler painted on its side. The propellers were only drawings, but a loud buzzing noise made them seem real. Backstage, one of the twins was spinning the tire of his bicycle wheel while the other held a playing card against the spokes. “Do you see anything, Lindy?” Millie called over the racket. “Nothing but water. What does the fuel gauge say?” Millie leaned forward. She and Jerry cocked their heads, but the steady buzz continued. “I said, soon our engine will start to miss,” Millie shouted. The twins slowed down the spinning bicycle wheel and intermittently touched the card to the spokes. “I don’t think we can make it,” Millie shrieked. The plane sputtered more and more feebly as the curtain closed. The twins banged pots with spoons. Millie and Jerry crashed the lids of garbage cans together like cymbals, while screaming their heads off. When the curtain opened, a stunned Lindbergh and Earhart lay near their battered plane. The nose was dented and there was a hole in the fuselage, just in front of the wing. The actors piled their belongings at center stage. Jerry had a jack-knife, some matches, and a Tailspin Tommy, Boy Aviator book. Millie dumped her pack to reveal a yo-yo and a box of cereal. “Is that oatmeal?” Jerry asked. “Great. We’re stranded with nothing to repair our plane and inedible cereal for rations.” Jerry paced. Millie and Jerry pretended to light a fire and heat Jerry’s metal canteen over it. Jerry poured water into his leather helmet and Millie sprinkled in Olsen’s Oatmeal. While Millie stirred, Jerry flattened the oatmeal box. Millie held it in place, covering the hole in the fuselage. Jerry used his jack-knife to coat it with layer after layer of the quick hardening oatmeal. The scene ended with the aviators admiring their work and agreeing to take off at daylight. The twins burst from backstage, their arms loaded with boxes of Olsen’s Oatmeal. They had Millie’s three boxes and the three that had been paid as admissions. Jumping from the wagon, they began pouring oatmeal into the hands of the kids who had come to watch the show. Jerry and Millie paraded around the barn. The twins and the others followed, pelting them with dry oatmeal. At last, Jerry and Millie stopped by the barn door and took their bows. The kids cheered. The next morning, Millie mailed for her wings. Within a month they were hers. She pinned them onto her collar each night when the Flying Ladies came on the air. Millie still loved the program, but she tried not to listen to the offers for premiums. When Jerry’s uncle’s chickens got sick from eating the cereal scattered around the floor of the barn, she vowed never to eat Olsen’s Oatmeal again.